Welcome to A Step To Health! We are an Integrative Health Care Center offering many ways to help you feel better. Join us in The Studio for dynamic movement classes and wellness workshops. Get the benefits of the Healing Heat of our Infrared Sauna. Click on the tabs above to learn more about our specialities. Our practitioners' hours vary and many of us do our own scheduling so please check the individual webpage of your practitioner to know how to reach them. Our office assistant, Melinda, is available during regular business hours and can be reached at (919) 643-2273. 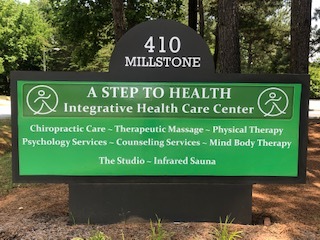 Because of our close proximity to both I-85 and I-40, we are able to serve residents of Hillsborough, Chapel Hill, Carrboro, Durham, Mebane, Efland, and many other small towns along the way.